Q: Why have you planted so many trees around your farm? A: To attract bird watchers. More on that in a moment: today’s Monday 3-6pm farmstand includes: sweet salad mix, teen spicy mix, teen arugula, baby arugula, cherry tomatoes, heirloom tomatoes, slicer tomatoes, recao, garlic chives, lemongrass, onions and carrots. 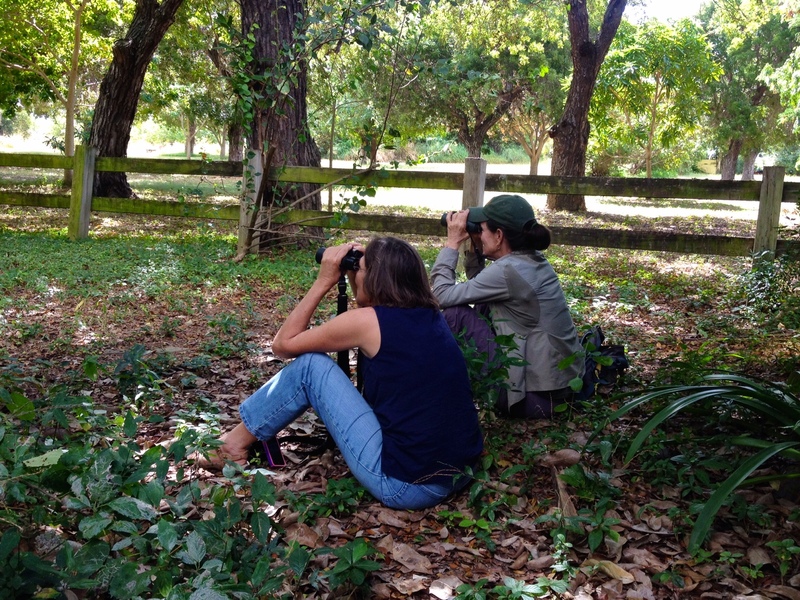 On January 27, we heard a strange noise in a densely shaded area of the farm. It sounded like this: We also heard tell-tale hammering on a tree trunk. The bird was indeed a woodpecker! 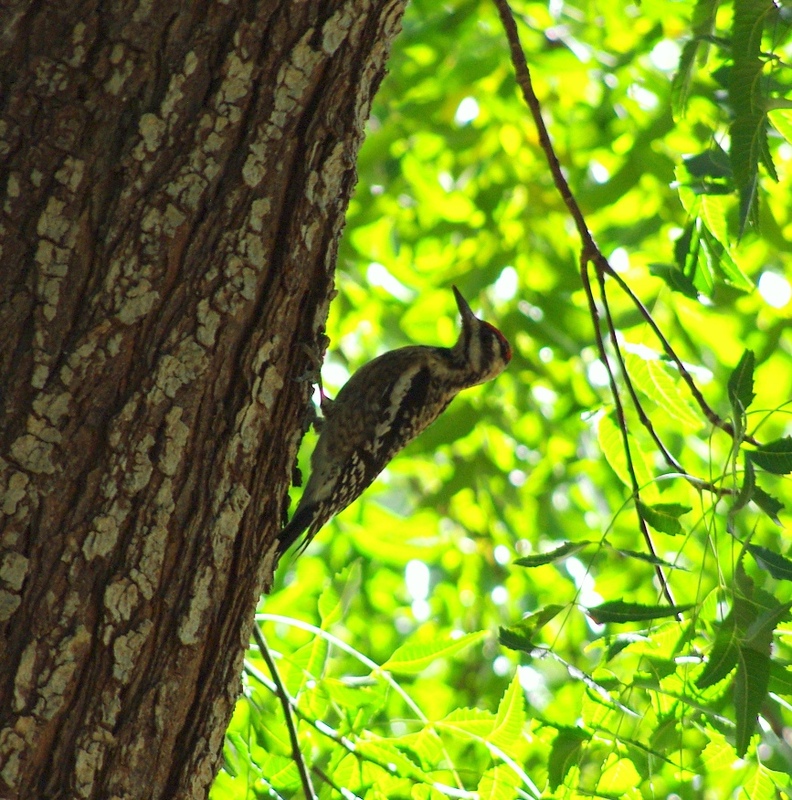 It has been identified as a young female yellow bellied sap sucker. Female yellow bellied sap suckers spend summers in the northern regions of North America, and do venture south to Central America and parts of the Caribbean for the winter, but not often in the USVI. 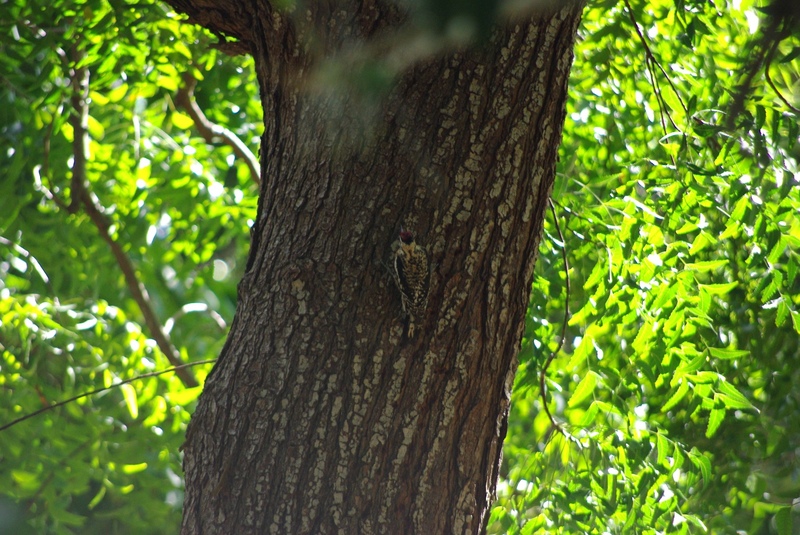 According to ebird.org, this is the first recorded sighting of one in the territory since 1999. Here’s a couple of Lisa Yntema’s shots! 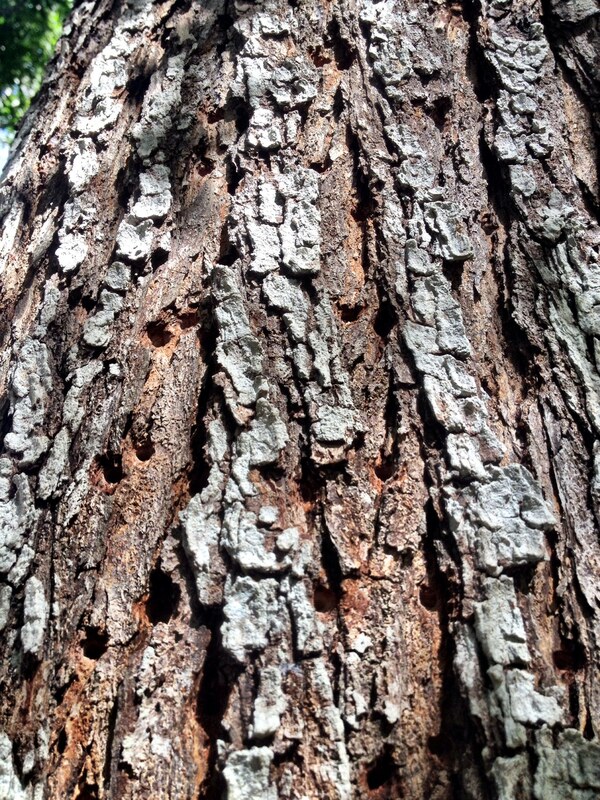 Our little red headed lady has peppered the neem tree with tiny holes, which drip sap that she likes to drink. The sweet, sticky sap also attracts bugs, which attract lizards. It’s pretty interesting how one little bird can shift an entire ecosystem around herself. She’s so industrious, we might have to call her “Martha”. ARTfarm Saturday Tomato Attack Continued! 10am This Morning! 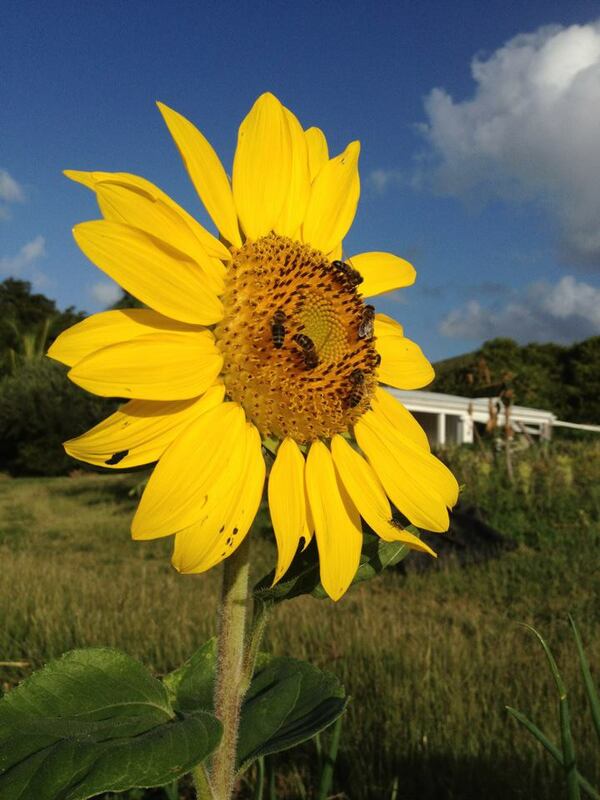 A yellow sunflower with a whorled center pattern faces the early morning light at ARTfarm on St. Croix. Fresh cut sunflowers are a cheery and long-lasting addition to your home or workplace! Today we’ve got the usual INSANE rainbow assortment of gorgeous, sweet, vine-ripened tomatoes from the gargantuan ‘puppy-sized’ heirloom down to the diminuitive cherry; sunflowers and zinnias for sale, along with cucumbers, sweet peppers, hot peppers, spicy salad mix, pumpkin, purple long beans, cooking greens, and lots of fresh herbs for salads, cooking and bush tea; and probably a few other things I forgot to mention. Broccoli, arugula and sweet mix, and papayas, will be available in short supply today. Happy Solstice from ARTfarm… Tomatoes galore at the farmstand today! Our old friend Edward White is back at ARTfarm for a few weeks, and we’ve got snazzy new ARTfarm reusable shopping bags for sale! Happy holidays! 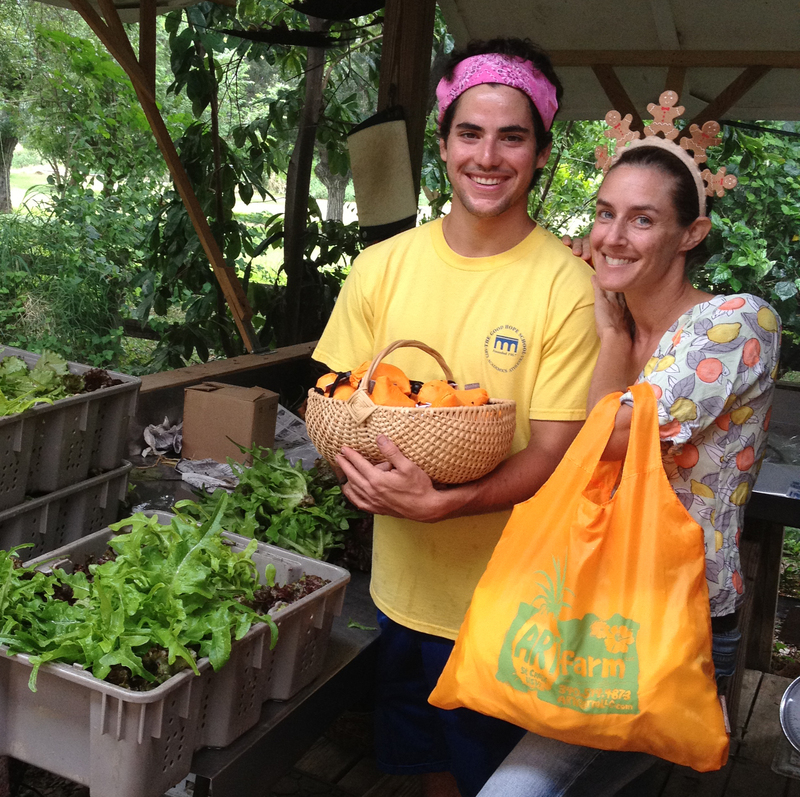 In 2012 we are going to move away from the use of plastic grocery bags at our farmstand. For years we have had a revolving system where customers bring in their clean grocery bags and share them with each other for their shopping. We figure if our customers have a snazzy and convenient, strong and roomy reusable, washable shopping bag to use here at ARTfarm AND at the grocery store, none of us will feel justified in picking up all those bags at the grocery store, and we can end the plastic grocery bags’ carbon footprint and inevitable journey to the landfill. To make it easy to switch, we have some stylish reusable shopping bags for sale at the farmstand today, with a great ARTfarm design on it — for less than the cost of a tee shirt. They stuff down tiny to fit in your bag, and are lightweight with a little snap so you can even keep it on your keychain. Throw them in the laundry to wash. They’d make great holiday gifts and stocking stuffers – so cute! Happy Solstice! And YES, we will be open Christmas Eve morning!! In the off season, when the tomatoes are NOT bursting off the vines, you’d think we would take it easy, go to the beach, or do some cool new paintings. Luca operating a trencher on a skid steer in the pastures at ARTfarm. We're laying poly pipe for livestock irrigation! Photo by Mitch Amarando. The off season is when we catch up on infrastructure projects. 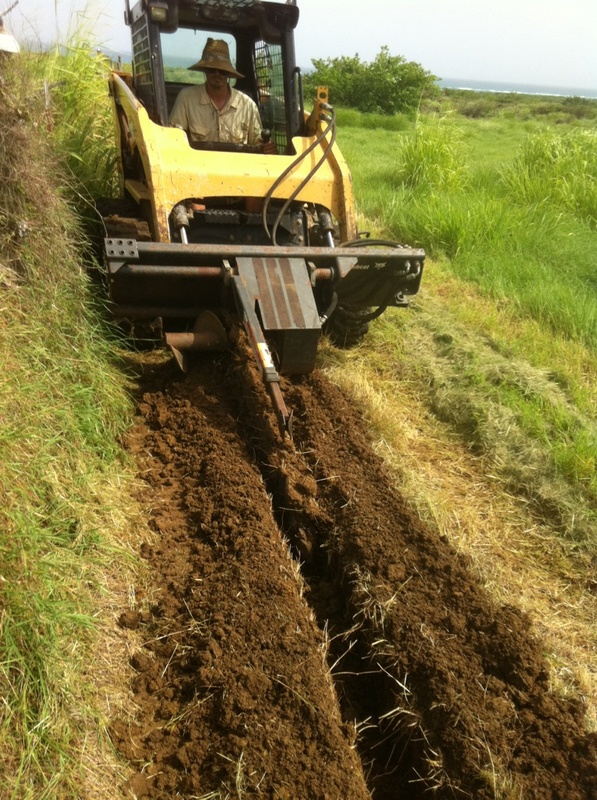 Luca has been cutting trenches with a skid steer using a hydraulic trenching attachment in our pastures, to bury water lines for our upcoming livestock project. We’ll be experimenting with multi-species grazing and micropasturing. We’re burying the polyethelene pipe so that it will be protected from UV damage, heavy equipment, fire, and chewing animals. It should last just about forever. ARTfarm Farmstand open today! Independently grown produce! For your holiday gathering this weekend, we’ve got burger fixins and more – microgreens, baby and teen arugula, spicy mix and sweet too, various basils, chives, lemongrass, mangoes, pineapples, breadfruit, fresh local eggs and honey. Show your independence from imported foods! We’re open this morning, 10am – 12 noon. We’d love to see you! 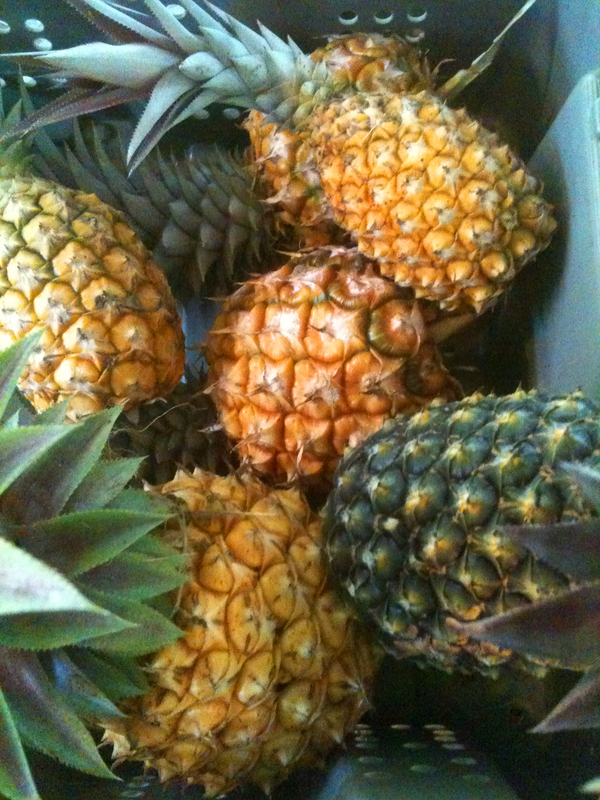 Different varieties of fresh pineapples harvested this morning at ARTfarm for today's farmstand. 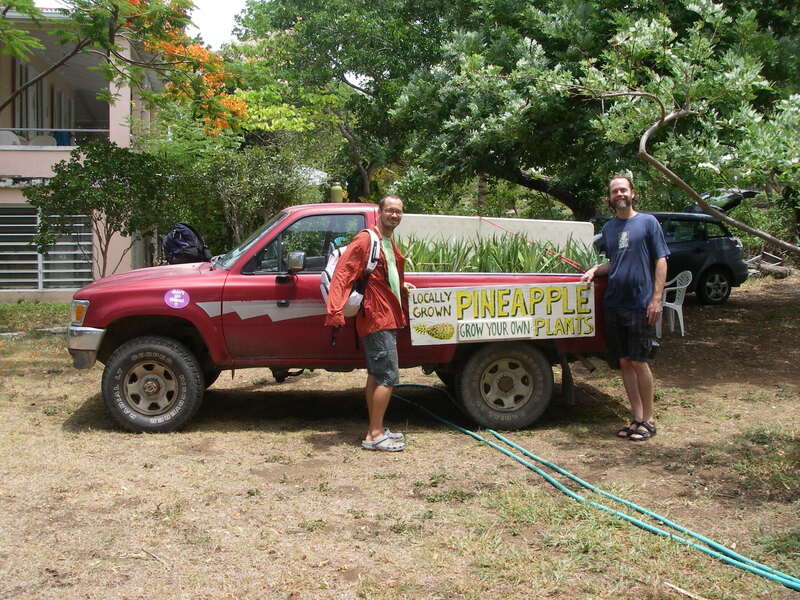 Luca Gasperi and Eric Ogden in 2008 with our red pickup truck holding the "Grow Your Own Pineapples" sign, on our way to Mango Melee! Happy shiny Saturday! Today’s farmstand features tender microgreens, baby mix with lettuce, mangoes, scallions, garlic chives, Italian and lemon basil, lemongrass, kangkong (asian water spinach), Sweetface chocolates, coconut-based ice creams, and honey! Amazingly, Luca was able to find one more row of lettuces that survived all the rains and so there will be lettuce in the baby mix today! This may truly be the last cut lettuce of the season. We’ll see you all at our booth #7 at the Mango Melee tomorrow at the St. George Village Botanical Gardens! We’ll be there with farmer Aberra Bulbulla, selling mangoes, pineapple slips (baby plants), jackfruit, breadfruit, young fruit trees and more. Come out to this fantastic annual event that takes place at the height of mango season on St. Croix, and taste all kinds of fruits, join the mango eating contest, and shop the many vendors: jams and jellies, tasty local foods, local fruit ice cream, jewelry and fashion, gifts, and fantastic plants and fruit trees for sale! Twelve noon to 6:30pm, get there early as the parking lots fill up quick! Thanks for your support. We really appreciate our customers. 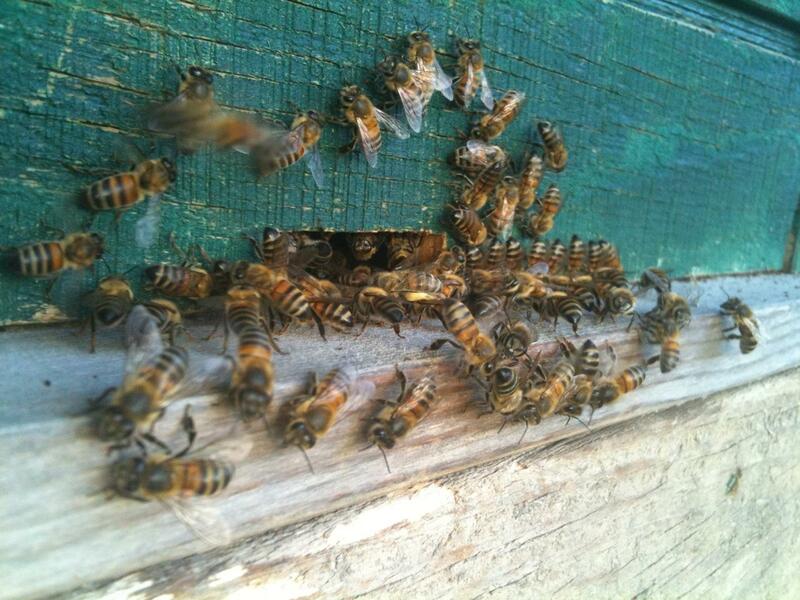 There are at least a dozen species of flowering trees going off this month at ARTfarm and around the South Shore zone, and our newly recolonized beehive is working very hard to keep up.